A new deck arrived in the mail for me today. I bought it for my birthday. It's the Tarot of Magical Forest tarot deck, and I'm enchanted with it. I'll be drawing a card a day from it for a while while we get acquainted. 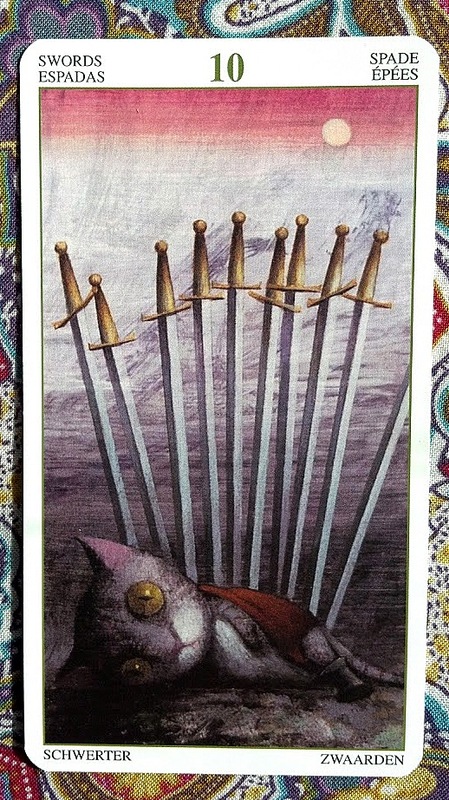 For my first draw from this deck I wish I had chosen a more pleasant card, but I can see how this card may be appropriate for me today. The cat in this card looks like he has been through quite a battle, and those wide open eyes make me think that, although the battle is over, he is replaying the battle over and over in his mind. I've been thinking all week about what happened Saturday night. I've talked to my husband about it. I've talked to my son about it because he is the one who picked me up, and I've decided I am not crazy, and I'm not to blame for what happened. It's time to stop thinking about it and move on. When I looked through this deck, there was one card that immediately became my favorite. 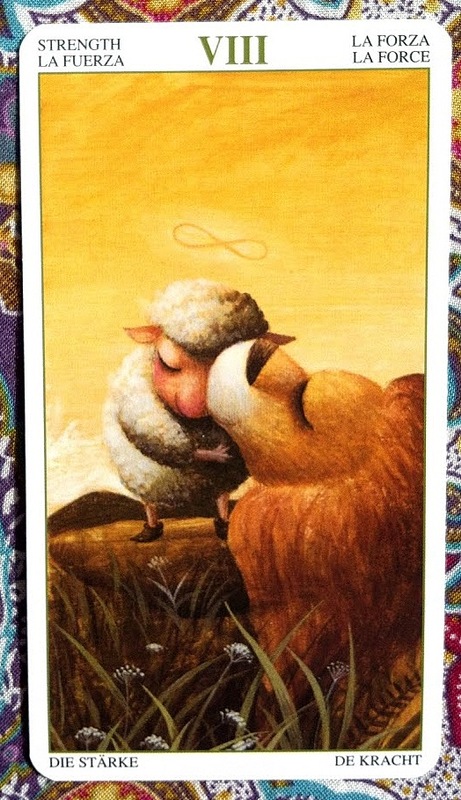 This strength card just makes me feel all warm and fuzzy. I could almost cry it's so sweet. So, I'm going to channel the energy of this card today, because after the difficult week I've had it feels like a warm embrace. Nice--I don't have this deck but I've seen others blog with it. Sorry, again, about your stressful time. I say never disregard your feelings. Even if they are only valid to you, they are still very important. Nothing is more important than your true feelings on something. Hope you have a healing weekend! Thank you, MM. And you're right. Trusting and believing in myself has been the theme of my life for the last couple of months. In the past, I've always been willing to second guess myself if it would make life easier on someone else. And to avoid confrontation. There's no one to confront in this case, but I'm listening to my intuition on this. I share, sometimes a little too much. I write. I sing. I try new things. I get stuck. I get unstuck. I get stuck again. I learn. I grow. I blog. I share. I Wish I Didn't Think What I'm Thinking.